Don't Go Soft, Play Hardball! 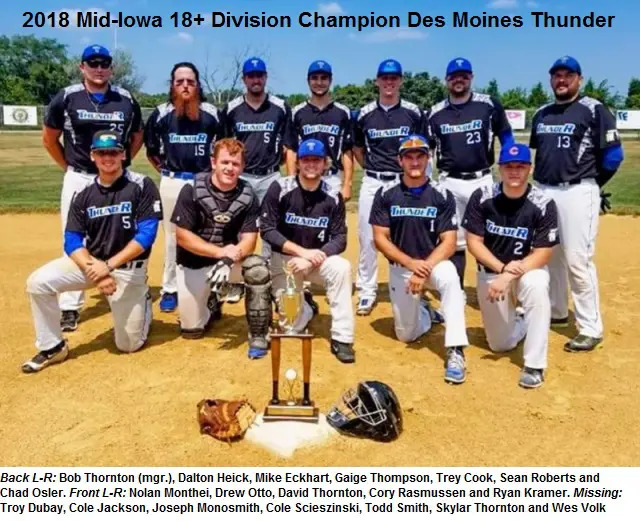 This year the Thunder team from the 18+ division of the Mid Iowa Baseball League was able to finally capture a season sweep in titles. For the last two seasons we have been able to win the regular season but come up short both times in the tournament. The Thunder success is based on returning some solid veteran players while adding some key energetic and very talented ball players. It was just a matter of time before we would get it done in the tournament, as we worked hard all offseason to accomplish this goal and it was so great to see it end the way we wanted. All season long we battled in a tough 18+ Division in the MIBL winning 10 straight to start the season. After wrapping up the Division Championship with a 2-0 game one win over our rival team “Bandits” we were handed our only loss of the season in a nail biter 7-6 game two ball game. Trey Cook threw an outstanding 3-hit 8.1 innings while Chad Olser came in to close the door on the Bandits in the ninth. Corey Rasmussen, Wes Volk and Cole Scieszinski all had two hits in game one. Thunder posted their best season to date with an overall 13-1 record, while only giving up an average of 2.91 runs a game while scoring nine runs per game. Season MVP Trey Cook was a perfect 8-0 with an ERA of 0.69 on the season, while striking out 56 batters in 52.1 innings of work. We got strong performances from all of our players this year with a lot of timely hits and clutch pitching performances. Some of our notable performers from the plate were: RF-Mike Eckhart (.500), C-Troy DuBay (.429) and 3B Sean Roberts (.425). In addition to Cook we got a huge boost from Gaige Thompson, who came off a Tommy John injury in 2017 while electing to work through it and not have the surgery, posting a 1.97 ERA with 16 K’s in 32 innings of work. 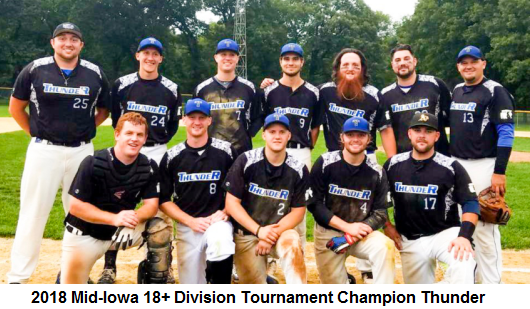 On Sunday, August 19, the Des Moines Thunder captured their first postseason 18+ Division tournament title with an 11-6 victory over the Des Moines Cubs. Sean Roberts was named tournament MVP, going 3×5 with two doubles, four RBI, three walks and one run scored. While Trey Cook picked up the win in the title game throwing six innings, Chad Osler picked up the save closing out the last three innings. Gaige Thompson was the winning pitcher in the Semifinal game where the Thunder beat the Cardinals 5-2. Thompson went 6.2 innings while Chad Osler closed out the last 2.1 innings. They combined for eight strikeouts in the win. Thunder is looking to carry this momentum into 2019 as we look to defend our titles yet again. © 2018, Men's Senior Baseball League. All Rights Reserved.